"Everything started last year when one day I wanted to make some boudoir shots I had in my mind, but nobody to pose for me except Barbie. So I photographed her and published the photos on my blog. Everybody laughed about it and found it was a nice idea. After that, everytime I wanted to test some ideas, I took Barbie as my model. One day she said to me ‘Hey Béatrice, now that I have my boudoir, can you be my wedding photographer?' LOL. So I started this crazy adventure! More seriously it was weeks and weeks of preparation, 3 days to shoot everything, a lot of sweat and finally a wedding day!" 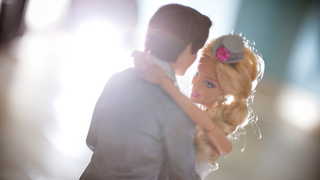 For something that began as a lighthearted photo test, it's the fairytale ending that Barbie and Ken so deserve.